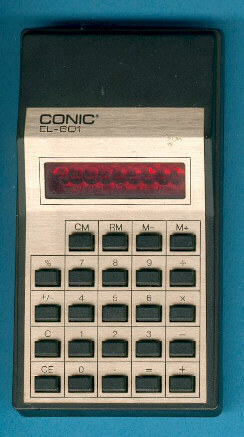 Size: 5.3" x 2.6" x 0.9"
You are familiar with this Conic EL-601 calculator ? You are right, this calculator - and the sibblings Audio Sonic U 100, Hercules TR-30, Junior EL-601, Nikjan EL-601, Wintron 3000 - is a nearly perfect copy of the TI-1250. Within the Datamath Calculator Museum we refer this calculator as Far East Generic Design III, it was probably introduced in 1978 after the famous Design I and Design II.